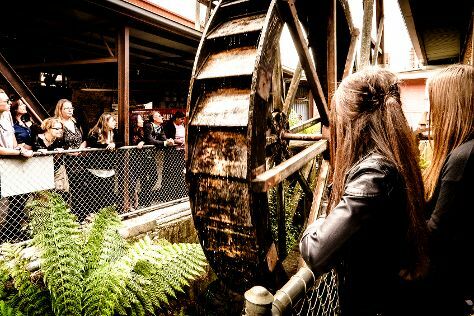 Design Centre Tasmania and The Mill Providore Gifts & Gallery will appeal to museum buffs. Woolmers Estate and Entally Estate will appeal to history buffs. Change things up with these side-trips from Launceston: Longford (Brickendon Colonial Farm Village & Brickendon Estate). There's lots more to do: identify plant and animal life at Tamar Island Wetlands, browse the eclectic array of goods at Evandale Market, get interesting insight from Tours, and learn about winemaking at Sharmans Wines. To find where to stay, maps, and tourist information, use the Launceston itinerary planning website . Sydney to Launceston is an approximately 5-hour flight. You can also do a combination of flight and bus; or do a combination of train, ferry, and bus. Plan for a bit cooler temperatures traveling from Sydney in March, with highs in Launceston at 26°C and lows at 11°C. Cap off your sightseeing on the 9th (Sat) early enough to travel to Bridport. Bridport is a small town on the north-east coast of Tasmania, Australia. Escape the urban bustle at Barnbougle Dunes and North East Rail Trail. Let the collections at Scottsdale RSL Military Museum and The Tin Dragon Interpretation Centre and Cafe capture your imagination. Explore the numerous day-trip ideas around Bridport: Mount William National Park (in Scottsdale) and Blue Derby Mountain Bike Trails (in Derby). It doesn't end there: play a few rounds at Lost Farm Barnbougle Golf Course and go for a walk through Bridport Walking Track. To find where to stay, photos, maps, and other tourist information, go to the Bridport trip planner. You can drive from Launceston to Bridport in an hour. March in Bridport sees daily highs of 26°C and lows of 11°C at night. Wrap up your sightseeing on the 12th (Tue) early enough to travel to George Town. George Town is a large town in north-east Tasmania, on the eastern bank of the mouth of the Tamar River. Kick off your visit on the 13th (Wed): meet the residents at Seahorse World, look for all kinds of wild species at Platypus House, get engrossed in the history at Beaconsfield Mine & Heritage Centre, pause for some photo ops at Paterson Monument, then see the interesting displays at George Town Watch House, and finally see the interesting displays at Bass & Flinders Centre. For other places to visit, maps, where to stay, and tourist information, refer to the George Town online trip itinerary planner . You can drive from Bridport to George Town in an hour. Expect a daytime high around 26°C in March, and nighttime lows around 11°C. Finish your sightseeing early on the 13th (Wed) to allow enough time to travel to Mole Creek. Mole Creek is a town in the upper Mersey Valley, in the central north of Tasmania, Australia. On the 14th (Thu), look for all kinds of wild species at Trowunna Wildlife Sanctuary, examine the collection at Pearn's Steam World, look for gifts at Brush Rabbit, then view the masterpieces at Deloraine Creative Studios, and finally admire the masterpieces at Deloraine & Districts Folk Museum. On the 15th (Fri), you'll have a packed day of sightseeing: explore the fascinating underground world of Mole Creek Caves, explore the fascinating underground world of Marakoopa Cave, then explore the fascinating underground world of King Solomans Caves, and finally take a peaceful walk through Westmorland Falls. To see maps, more things to do, photos, and tourist information, you can read our Mole Creek online travel route planner . Traveling by car from George Town to Mole Creek takes 1.5 hours. In March, daytime highs in Mole Creek are 26°C, while nighttime lows are 11°C. Finish your sightseeing early on the 15th (Fri) to allow enough time to travel to Campbell Town. Campbell Town is a town in Tasmania, Australia, on the Midland Highway. Start off your visit on the 16th (Sat): contemplate the long history of Ross Female Factory, stop by Classwood, see the interesting displays at Tasmanian Wool Centre., then make a trip to Four Corners of Ross, then take in the views from The Red Bridge, and finally appreciate the history behind Convict Brick Trail. On the 17th (Sun), you'll have a packed day of sightseeing: browse the collection at The Book Cellar, then tour the pleasant surroundings at Valentine Park, and then see the interesting displays at Gallery 81. To see traveler tips, more things to do, and more tourist information, you can read our Campbell Town travel route builder website . Traveling by car from Mole Creek to Campbell Town takes 1.5 hours. In March, plan for daily highs up to 26°C, and evening lows to 11°C. On the 18th (Mon), you're off tohome.